INVESTIGATORS have swept through two Vietnamese boats anchored off Gladstone's shore, believed to be involved in illegal fishing. On Friday, 29 Vietnamese crewmen from the two boats were escorted to Gladstone by the Australian Border Force, accused of poaching sea cucumbers illegally from the Southern Great Barrier Reef. The latest plight of sea cucumber poaching off Gladstone has left fishermen frustrated and calling for tough penalties. Duncan Reilly spotted the two vessels on Saturday during his reef fishing trip. As a keen fisherman, he said it was frustrating to see the Vietnamese crews take advantage of Gladstone's reef. "I wouldn't have an issue with it if they adhered to all the size and bag limits but they have a bad reputation not to," he said. The 29 crewmen on the two vessels were caught with 13 tonnes of sea cucumbers. 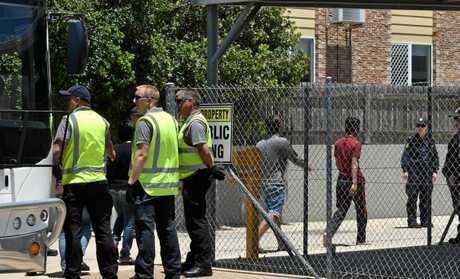 They are now languishing in a Darwin detention centre as investigations continue. "We were on our way out to the reef and seen them anchored on the other side of the shipping channel over East Banks," Mr Reilly said. "We drove up for a closer look and took some photos and that's when we saw the fishos in dark overalls walking through them and emptying eskies and drums." The Vietnamese fishermen travel more than 6000km to poach beche-de-mers, better known as sea cucumbers, which are a delicacy in Asia. It's believed tougher policing of the oceans in Asia and low fish stocks has driven the crewmen further ashore to Australian waters. 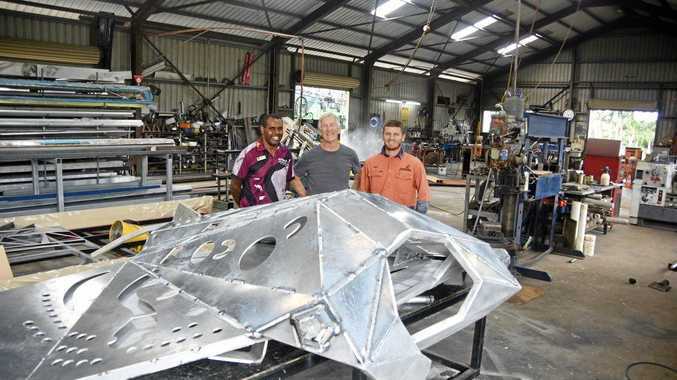 Figures from the Australian Fisheries Management Authority (AFMA) show 20 foreign fishing boats were apprehended in 2015-2016, compared with six in 2014-2015. The Asian delicacy can fetch between $10-70 per kilogram, meaning the catch on board the vessels captured on Friday could have been worth up to $900,000. 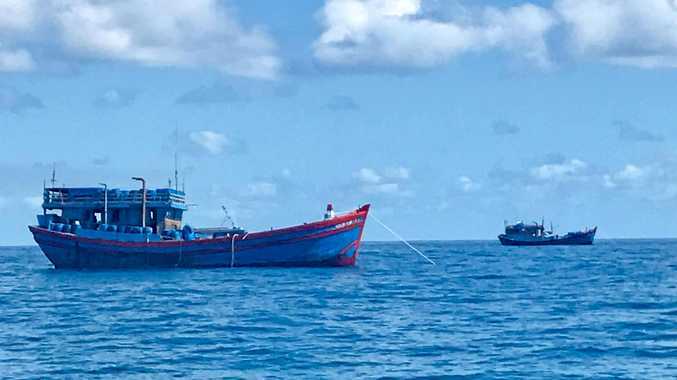 Friday's capture near Saumuraz Reef was the fourth Vietnamese vessel crew detained, accused of illegally catching sea cucumbers off Gladstone since November. "With those double prongs squeezing out fishing activity in the southeast Asian and north Asian domains, they are looking at the next geographic opportunity which is the massive piece of sea out there in the Coral Sea, the Pacific Ocean and the north of Australia," Australian Border Force Commissioner Roman Quaedvlieg told the Courier Mail. Penalties for illegal fishing for sea cucumbers could include maximum fines of up to $1.35 million, and possible forfeiture of vessels, catch and fishing equipment.